July 9, 2017. Today was day 2 of a short family hiking vacation. We did this last year with our kids, doing one short hike a day. 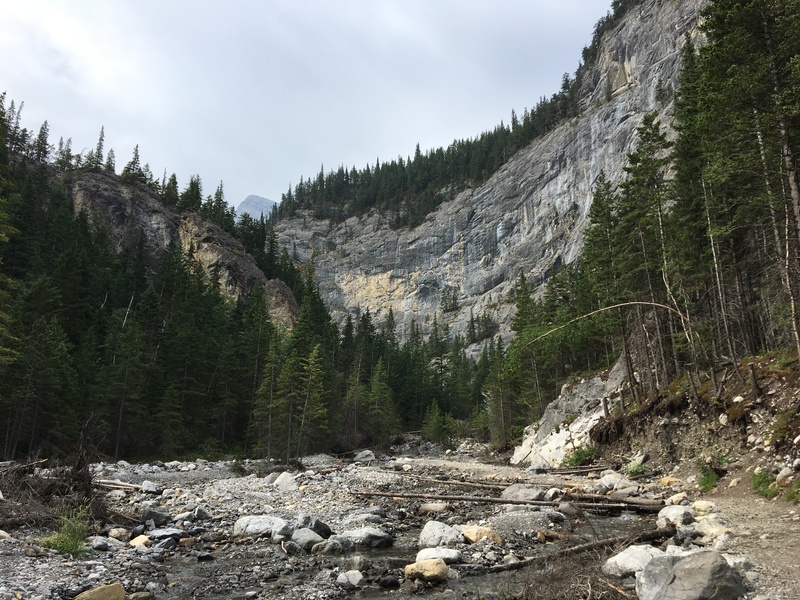 Last year we hiked Rawson Lake, Ptarmigan Cirque, Grassi Lakes and Elbow Lake. This year we only have 3 days but the intent is the same: short, fun hikes with the kids, followed by hanging out at the hotel. Yesterday we did Ptarmigan Cirque and everything was fine. There were one or two very brief episodes of complaining from one kid or another, but anyone that’s ever been hiking with kids knows that you need to push through some of that or you’d never get anywhere. The day was a success, and we all came out of it feeling great. Today was a very different day. The forecast called for another very hot day, and it definitely was. So we got started early and made our way to the trailhead for McGillvaray Creek. We haven’t been to this one before, but there’s a good description in Daffern’s Kananaskis Country Trail Guide Vol. 3. The prospect of a hike up a canyon culminating with a dramatic chockstone perched halfway up the canyon wall was very promising. Unfortunately, the mosquitoes had other plans. We came prepared, of course, with Deep Woods Off and clothing that covered our limbs. This made the experience less horrible than it otherwise may have been. However, the sheer volume of swarming insects was too much for 2 of our 3 little hikers (interestingly, it was our youngest that wanted to soldier on). Honestly, there were a lot of mosquitoes. But they were also mostly repelled by the measures we’d taken, and they weren’t landing on us very much if we kept moving. I was pretty sure once we got out of the initial forested part of the trail we’d be okay. But eventually there were tears of despair and anguish. At that point, we decided to turn back. Just so the whole day wasn’t a total loss, we stopped at Heart Creek and went part of the way up the canyon. Everyone’s mood was a little better by then, but not so much better that we could complete that relatively easy route (which my 2 youngest had previously done with me in the fall of 2016). The episode did get me thiking: just how much do you push kids in non-essential endeavours like hiking? If I cajole my kids to push on through mosquito swarms despite their discomfort, am I teaching them resilience or am I an obnoxious hockey-dad, transplanted to the mountains? The best I can come up with is that you have to find that point at which the fun persists, despite the discomfort. That point will be different for different kids, and for different discomforts. The same kid that will soldier up any trail, no matter how steep, may balk at the idea of walking in the rain. If you can maintain your kids’ hiking activities in that sweet spot, maybe the chances improve that you can pass on your enthusiasm for tromping up mountains and through canyons. One day they’ll brave the mosquito swarms because they’ll know that the experience that lies ahead will make the effort worthwhile. Here’s where we turned back on the Heart Creek trail. Up ahead is where it gets interesting. Oh well. My three keys to success have been snacks, water, and a perk at the end. The snacks tend to be more treat-like than the snacks they get at home. I am considering getting Camelbaks for my kids so they have their own “pro gear” and I don’t have to carry all the water for them. I committed my littles to hiking Goat Haunt in Waterton with me. It is advertised as 11km, pretty flat but it was almost 16km. They kept on trekking because they had heard there’s a rope bridge at the end. Was there a rope bridge at the end? I got a “bag of tricks” for our oldest last year. It was a good hiking backpack filled with little doo-dads like a compass, a flint and steel and even a small Leatherman. It also had one of those platypus water carriers. It was…mildly successful in terms of cultivating an outdoorsy attitutde. But the gear is good quality. It’ll be ready to go on that fateful day when one of his friends invites him out for a hike.